Moffat County High School swim coach Meghan Francone goes over lane assignments with athletes midway through the Moffat County Meet. MCHS girls are nearing state-qualifying times after successful races in Glenwood Springs and Grand Junction. Moffat County High School swim results from Glenwood Springs Demon MeetSwimmer(s) — Time, Place50-yard freestyleAlexa Neton — 30.55, 8Jeni Kincher — 31.09, 11Alyssa Chavez — 34.00, 23100-yard backstrokeMolly Neton — 1:11.49, 7Katelynn Turner — 1:20.93, 14Alyssa Chavez — 1:33.05, 23100-yard breaststrokeKelsey McDiffett — 1:22.80, 7Jaycee Holman — 1:39.70, 24Ellina Jones — 1:46.18, 27100-yard freestyleJeni Kincher — 1:07.62, 12Katelynn Turner — 1:08.84, 14Jaycee Holman — 1:16.28, 24Jade Holman — 1:22.74, 32200-yard individual medleyKelsey McDiffett — 2:40.84, 7Molly Neton — 2:45.53, 10500-yard freestyleAlexa Neton — 6:47.87, 5200-yard freestyle relayJeni Kincher/Jaycee Holman/Ellina Jones/Alyssa Chavez — 2:13.68, 14Tayla Siminoe/Jade Holman/Sammi Beaver/Brenna Knez — 2:36.78, 20200-yard medley relayMolly Neton/Kelsey McDiffett/Alexa Neton/Jeni Kincher — 2:18.10, 6Alyssa Chavez/Jaycee Holman/Katelynn Turner/Ellina Jones — 2:33.73, 9Allison Jacobson/Jade Holman/Brenna Knez/Tayla Siminoe— 2:58.39, 16— The team placed seventh overall. 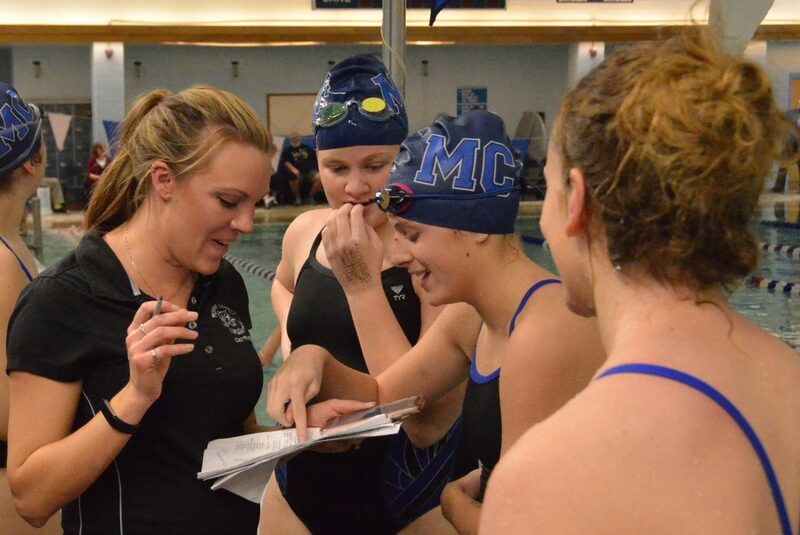 Several meets are in the books for Moffat County High School girls swimming, and with one more to go this weekend, the start to the season is already looking promising. MCHS girls attended the Glenwood Springs Demon Meet Dec. 8, as well as the Southwestern Conference Relay Meet Dec. 9, placing seventh and 10th, respectively. The Glenwood event was a larger one than coaches Meghan Francone and Melany Neton expected, though aquatic athletes followed their Dec. 1 home meet strongly. Among the best results was Alexa Neton’s performance in the 500-yard freestyle, her first high school competition away from Moffat County’s metric pool. She took fifth in the race at 6:47.87. The Bulldogs also earned seventh in three events — Kelsey McDiffett in both the 100 breaststroke and 200 individual medley and Molly Neton in the 100 backstroke. McDiffett’s 1:22.80 in the 100 breast is less than three seconds from a 3A state-qualifying time, while at 1:11.49, Molly Neton only needs to shave 1.5 seconds from her backstroke to go state. Alexa Neton also placed eighth in Glenwood’s 50 freestyle, edging out teammate Jeni Kincher, of Meeker, who won the race at the Moffat County meet. The relay team of McDiffett, Kincher and the Netons took sixth in the 200 medley, while Kincher joined Jaycee Holman, Ellina Jones and Alyssa Chavez for 14th in the 200 free relay. The following day in Grand Junction saw the quartet of McDiffett, Turner and the Netons break two minutes in the 200 free relay at 1:59.77 to come ever closer to the state standard of 1:56, while the same group is also close to the medley’s 2:10 state time at 2:13.58. Friday and Saturday, MCHS will be in Montrose with the hopes of earning a slot at state before the end of 2017.